It’s the leash they could do, as annual outing draws as many as 120 tri-colored canines. If the proverb “every dog has its day” is to be believed, that day would be Saturday, March 10, for the Bernese mountain breed. Owners of the large dogs that weigh from 70 to 100 pounds as adults and are known for their tri-color coat and gentle disposition will gather at Belmont Lake State Park in North Babylon for the annual Long Island Bernese Mountain Dog Walk. 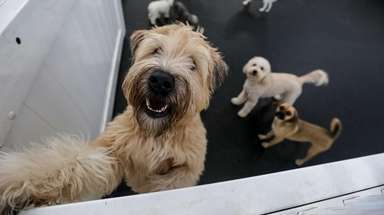 The event, now in its seventh year, has attracted as many as 120 dogs and people young and old from Long Island, Manhattan and Westchester who walk through the park and around the lake. The first Bernese mountain dog walk was held in 2011 at Gardiner County Park in Bay Shore and was the brainchild of Joan Gabriel, a Bayport resident and Bernese mountain dog owner. Gabriel was on the board of the Bernese Mountain Dog Club of Watchung, which serves the New Jersey, southern New York and eastern Pennsylvania region and seeks to preserve and protect the breed and to promote appreciation for it through educational programs and activities. “The president asked everyone to put a fun event together that would involve Bernese owners and their dogs,” Gabriel says. After 70 dogs attended the inaugural stroll with their owners, Gabriel was convinced these dogs’ paws were made for walking and decided to make it an annual event. In the years since, the walk has been held at Blydenburgh County Park in Smithtown and Belmont Lake State Park every March. 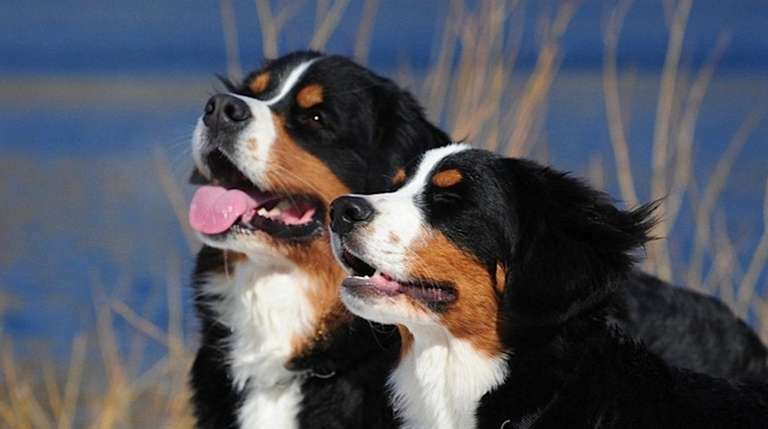 On separate occasions during the year, Martha Clara Vineyards in Riverhead, Northport Harbor, Port Jefferson Harbor and Black Rock Forest Consortium in Cornwall, New York, have also hosted smaller-scale Bernese mountain dog walks. Planning the event has been no walk in the park for Gabriel, but it has fulfilled her goal of getting people who have this breed together and encouraging them to enjoy the dogs, each other’s company and the fresh air, she says. The walks last about an hour, but Gabriel says attendees like to hang around and talk before and after. The breed is easy to fall in love with, Gabriel says, because of its beauty and disposition. And from her experiences, those who are fans of the dogs are not quick to shed their adoration — even when things get messy. Gabriel says people are often surprised by how much hair Bernese mountain dogs lose. “What they don’t realize is that beautiful coat they have sheds off completely,” Gabriel says. The breed also requires a lot of attention and is not all that calm, those who own them say. Even so, Bernese mountain dogs are said to make great companions. They love people and are loyal and smart. Fred Monahan of Medford has attended all but one of the March Bernese mountain dog walks and says he has made acquaintances at each event. “Each time there are more people with their dogs,” says Monahan, 60. He plans to bring his 8-month-old dog, Oliver, to this year’s gathering. Monahan says what he enjoys most about the “feel good” event is the walk itself. “Being with your dog in such a nice park with other people and their dog is very uplifting,” Monahan says.